The Dirigistes and overzealous macro-prudential regulators will derail banking union and deeper economic union. The same Dirigistes and overzealous macro-prudential regulators will trigger a further economic slowdown that leads to further ECB monetary policy easing. The EU and America can never come to a comprehensive agreement on trade under their current respective political leaders. The ECB has adopted a rolling line of defence, to enable banking sector consolidation without disrupting the credit creation process. The ECB’s rolling line defence is predicated upon a rescue by policymakers who are in fact besieging it. With surprising objectivity and clarity, the IMF has politely suggested that the Eurozone may wish to prepare to deal with the next economic slowdown. This classic understatement belies the fact that this slowdown has already been gestating for at least a year. The IMF also politely identified the external threats of trade wars and Brexit as the causes. Eurozone policymakers can, therefore, blame said external forces for ruining their beautiful recovery. They will, however, have to blame themselves for not responding, if they fail to react with policy stimulus measures proportionate to the threats. The size and complexity of the threats demand that elected policymakers will have to "do whatever it takes". Currently, they are either burnishing their populist bona fides or trying to incorporate them into their own manifestos. Whilst they do so, they rely upon the ECB to do the heavy lifting. Unfortunately, the ECB has yet to respond with monetary policy measures that are proportionate to the threats. Both policymakers and the ECB currently assume that the global and Eurozone economies will rebound in mid-to-late 2019. The ECB is less sure about the rebound, so it has engaged a monetary policy afterburner called TLTRO III. Unfortunately, there is very little monetary aviation fuel in the tank, and some ECB aviators are choking off the emergency tank fuel-line already. In the meantime, the fuel gauge and the altimeter continue to fall, whilst the political compass has lost its true North. The Brits are fumbling with their parachutes, whilst the Americans are bombing the landing strip. 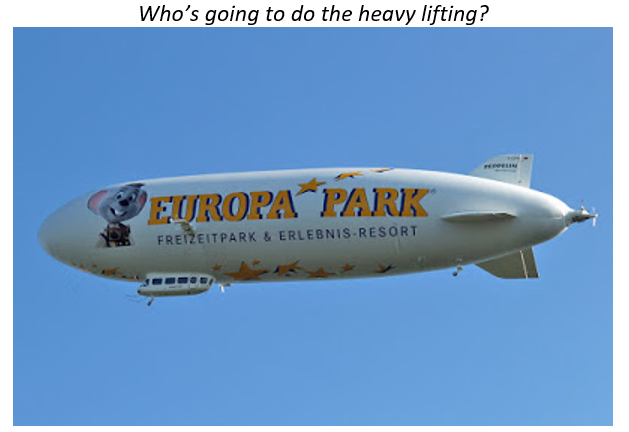 Captain Draghi is retiring before he has landed the giant economic dirigible. Co-pilot "Rehnfeld" is reaching for the controls as the dirigible begins to run on fumes. It's disaster movie stuff! The latest signals are that EU leaders are not going to blame themselves. They intend to blame Britain for forcing them to trigger a Hard Brexit unilaterally, in the face of UK politicians playing domestic UK Premier League instead of European Champions League footie. EU politicians have noted that the longer the situation drags on, the more impact Britain will have on EU political decisions going forward. The threat to the European Project, created by this overhang of British political influence, is now viewed as being more painful than any Hard Brexit. 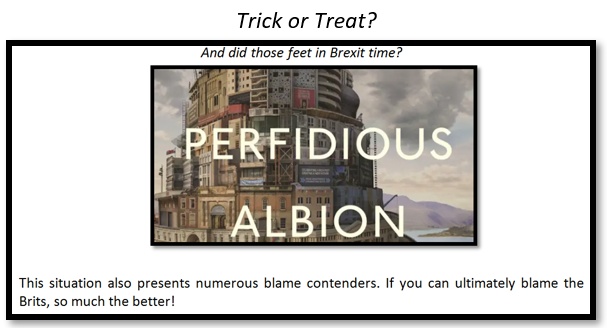 Britain has been told that it will leave by trick or by treat on All Hallows Day. President Macron was blamed as the messenger, for his style of delivery, but the EU's message was blameless. The EU is, therefore, now driving the Brexit process; and it is driving towards a Hard Brexit outcome. Having asked to leave the party, Britain will now be forcibly ejected for malingering. French finance minister Bruno Le Maire informed Britain that this is now the highest probability outcome, as the EU seized both the narrative and the controls. Reacting to this imminent fate, whilst its own politicians bicker, the Bank of England responded with contingency measures. Governor Carney estimates the probability of a Hard Brexit as "alarmingly high". These contingencies involve the extending of emergency liquidity operations into June. The bank of England, just like the ECB's recently announced TLTRO III, is therefore walking into the next phase of monetary policy easing on the platform of an emergency funding program. 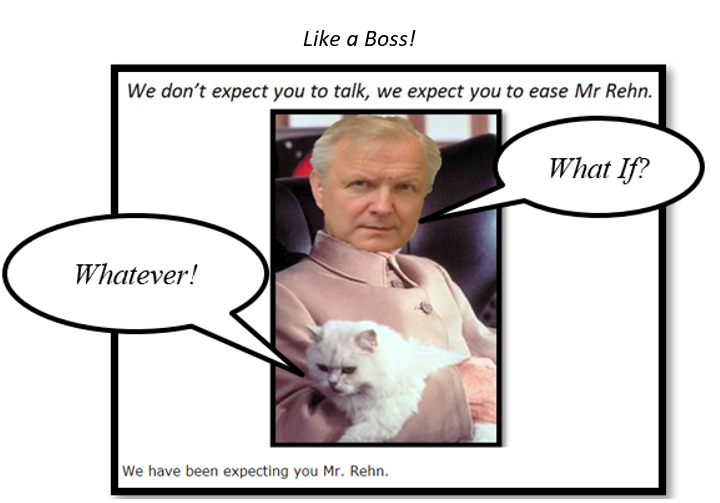 With the French effectively vetoing Jens Weidmann's hopes of being the first German ECB President, Ollie Rehn aka "Rehnfeld" has seized the tactical initiative to become the compromise Franco-German proxy. French finance minister Bruno Le Maire praised Draghi for his "courage" to do QE. He inferred that the next ECB President should have the same stuff, thereby nixing Weidmann and providing "Rehnfeld" with his auto-cue. As we shall see later, "Rehnfeld" is no slouch in taking the initiative. Having already inflicted the sado-monetarist Marquis de Trichet on Eurozone monetary policy, which has largely contributed to the "courage" they admire so much in Mario Draghi, the French know that they won't get a second chance anytime soon. They now have their designs on the soon to be vacant European Commission presidency instead. The best that the French can therefore do, in relation to the ECB presidency, is to block the Germans. In an interview with Die Welt, "Rehnfeld" preyed upon German fears of the loss of its biggest EU export market in Britain. He called upon his hosts not to "underestimate the risk" of a Hard Brexit and promised that he would be there with the emergency liquidity, if Britain stumbles out of the EU in a disorderly manner. The Germans will love "Rehnfeld". His native Finland was on their side back in World War II, and his current sentiments lie very close to theirs, at this, their latest existential crisis point. Dutch Governing Council member Klaas Knot is empathetic towards "Rehnfeld's" view that the risk of a Hard Brexit has been under-estimated. "Rehnfeld" would, therefore, be a good proxy for Northern European economic and political interest. A previous report suggested that it was only a matter of time before Britain was framed as the enemy; and thus, the casus belli for further monetary policy easing. "Rehnfeld" has chosen to use this as a stepping stone in his illustrious career. The French will also love him for his ostracism of Britain and his challenge to Weidmann. More importantly, the French will love "Rehnfeld" for hinting that he is ready for more QE to deal with the "underestimated" risks in the Eurozone. "Rehnfeld" has already promised a full review of monetary policy, in light of the fact that the transmission process is not working. Such a bold move contrasts with Weidmann's insistence on the return of monetary policy and the ECB's balance sheet to the place where they were before the GFC. "Rehnfeld" alludes to his dubious compromise attribute as the "merit" required for the position. It is not an exaggeration to claim that "Rehnfeld" is already talking like the next ECB President. He is in fact the only Governing Council member, save Draghi, talking in this way. His recent authoritarian and authoritative outline, of what the ECB will do next, sounded just like authorized textbook ECB president press conference material. First, "Rehnfeld" opined that the economic slowdown is in fact permanent. Then, he signaled that the TLTRO III will be the first tool that the ECB throws at it. Details of how much and when this will be thrown will now be forthcoming much sooner than initially guided. "Rehnfeld's" belief is that the combination of solid national domestic demand and TLTRO III will be enough to evade recession. In any event, further rate hikes this year are off the table, just in case. He was also quick to point out that some Eurozone negative interest rates may be made positive this year and that this will not be an interest rate hike per se. It all sounds like a plan, until "Rehnfeld" can get his promised monetary policy framework review done this year. At the end of this review, something more significant than TLTRO III and interest rate tweaking awaits. To illustrate the presidential tone of "Rehnfeld", a comparison with Governing Council member Ewald Nowotny's simultaneous guidance can be made. According to Nowotny: "to make this a successful program, it (TLTRO III) has to be well-prepared. And also one must not forget we now have TLTRO II (in place)… so I think the time is the correct one (response)." "Rehnfeld" brings TLTRO III forward, whilst Nowotny wishes to play for time with TLTRO II running to expiry. Governing Council member and Germanophile Jozef Makuch presents a similar figure for comparison and contrast with "Rehnfeld". Makuch views the current problems in Germany as temporary and sees the likelihood of recession there as "very low". Following the French "courage" theme, for the next ECB president's required skill-set, Executive Board member Benoit Coeure noted that the central bank has not yet reached the limit of what it can do to ease monetary policy. Rather more alarming, than Coeure's boundless optimism, was the admission from his German colleague that the ECB has a critical flaw in its models. According to Sabine Lautenschlaeger, the ECB has consistently underestimated the slack in the Eurozone labor market. Such an admission from a reviled German monetary policy Hawk is a seismic shift. It also speaks to the parlous state of the Germany economy. The ECB has allegedly made this mistake by failing to note the fact that many people, who have dropped out of the labor-pool, have not jumped back in so far. The implication is that they will never do so. The observation of tight labor markets and attendant inflation risk is thus pure artefact. One could say that Lautenschlaeger, rather than Weidmann, has the appropriate level of "courage" to become the next ECB president. She will undoubtedly replace Weidmann as Bundesbank president, but, such is the level of institutionalized misogyny at the ECB that, she will have to wait another decade until she is considered. Lautenschlaeger's long march does evince the fact that a feminine influence on Eurozone monetary policy is growing. The Bank of Italy is positively embracing such influence by contrast. The academics at the Bank of Italy are also taking a courageous approach, to influencing the ECB's monetary policy framework review, this year as advertised by "Rehnfeld". Writing in Vox, the thought leaders at the Bank of Italy advocate the adoption of the data-dependent flexibility, promoted by Fed Governor Lael Brainard, in order to deal with uncertainty. Sensing that momentum was waning and the ball that is the Eurozone was about to roll backwards down the hill, Mario Draghi stepped in and issued a holding statement. This holding pattern was intended to fill the time gap until the next Governing Council meeting. At this later meeting, a more substantial attempt was made to then nudge the ball up the hill. Noting that the risks to the downside are tilting more extremely, Draghi opined that intrinsic Eurozone strength is sufficient for the present. In the event that it is not, over a longer time-frame, the ECB has plenty of tools to throw at the problem. The first tool thrown will be guidance. His guidance was that monetary policy currently requires "patience, persistence and prudence". Loosely translated, this means that "monetary policy stimulus remains essential". Governing Council member Francois Villeroy de Galhau, swiftly rushed to support Draghi. Villeroy does not believe that the Eurozone will fall further into recession. He is also very happy to blame its problems on external factors. He does not seem to understand that the Eurozone may soon internalize the trade war externality with America. With an eye on the soon to be vacant ECB presidency, Villeroy also tried his arm at sounding presidential. "Structural Change and Monetary Policy Uncertainty". Villeroy is implying that the ECB's sacred cow, of the sole inflation mandate, will be replaced with something far more complex after the monetary policy framework review is concluded. Such a move could only be pulled off by a neutral i.e. an ECB president who is neither French, German nor from Southern Europe. Villeroy's ultimate objective seems to deselect him from executing what he has nudged into life. Thankfully, there is a default prioritization of the worst-case scenario in Villeroy's uncertainty policy framework. The ECB's prime directive would then be to find the next highest probability threat and deal with it. This is, however, undermined by his refusal to throw all available resources at said priority. Presumably, the level of uncertainty, about the worst-case scenario, precludes the ECB from being irrational and throwing all its eggs into one risk basket. Having identified the worst-case outcome, the ECB will then address it incrementally; just in case it ceases to be the worst-case outcome in the future. This behavior is internally flawed, because it is lacking in credible commitment to do anything other than identify the main problem. Failure to address the problem convincingly then undermines credible commitment. The ECB will never be wrong in its prognosis, but its response will never be fully accepted. The fact that the ECB is not certain about what is the worst-case scenario is ultimately more damaging to its credibility. In addressing uncertainty, the ECB simply creates more uncertainty. On the plus side, however, the ECB is abandoning the anachronism of a single inflation target in a period when inflation is in a secular low phase. The ECB is also progressing towards the kind of risk management framework, that the Fed seems to be stumbling towards under current attacks from President Trump. Villeroy's presidential tone, although data dependent, is quite prepared to put the normalization on hold for as long as necessary. It is also prepared to tinker at the margins of the TLTRO III to inject further liquidity. It doesn't sound like "do whatever it takes" just yet, but it is clearly an announcement that he has the "courage" to do so. Before this final throw of the monetary policy dice, he would like Germany and Holland to U-turn on their "Black Zero" fiscal policy and expand a fiscal stimulus. With the other eye on Brexit, as the catalyst to doing "whatever it takes" again, Villeroy also warned that a Hard Brexit outcome needs to get discounted by Mr. Market. Such a discounting process is a crucial ingredient of the catalyst, in addition to the news headlines and commentary accompanying the price discovery. The way things are shaping up, Draghi could actually say good bye with the promise that his successor will "do whatever it takes" again. The little French tell on "courage" and "Rehnfeld's" cryptic "merit" quote, suggest that "do whatever it takes" is in the guidance auto-cue. It is just not yet at the top of the teleprompter. 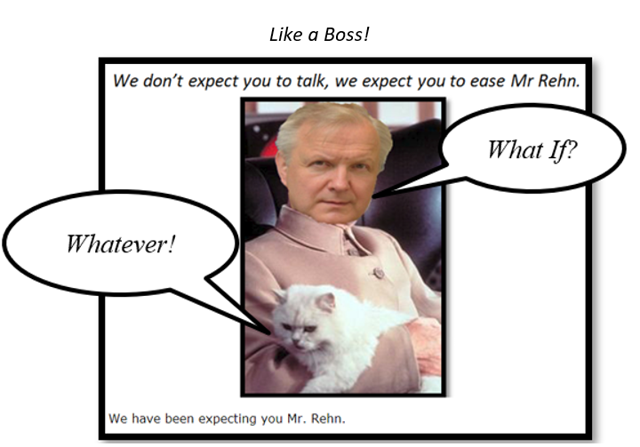 Retiring ECB Chief Economist Peter Praet also gave this impression, when he weighed in to support his colleagues. In Praet's opinion, the natural rate of interest in the Eurozone will remain low for some time. The current slowing growth situation will be met with guidance first; but the ECB has the full range of unconventional tools in place should it need to use them later. Draghi also seemed highly motivated to mitigate the impacts of continued ZIRP/NIRP on the banking sector. This perception may, however, be a deliberately disingenuous component of his style of guidance. Draghi's stock in trade has always been to flatter Mr. Market in order to deceive and then lead him. This could be taken as a signal that there is either more mitigation to come, or that the current ZIRP/NIRP will remain in place for a considerably longer time. Draghi's guided concern has translated into theories about tiered interest rates across sectors and asset classes. The debate may, however, only be an illusion for the purposes of calming market perceptions. Sources within the ECB have leaked, that as yet there is very little actual follow through into new policy and procedure. Draghi has stimulated the debate. There is unfortunately no sign of consensus amongst his colleagues. Ewald Nowotny thinks that bank risk mitigation is worth investigating. Governing Council member Klaas Knot currently sees no need for mitigation. He demands clear proof, that negative interest rates are not working, before he will entertain mitigating their impact on the banking sector. "Rehnfeld's" suggested monetary policy framework review this year could lead to such a consensus. Outgoing Chief Economist Peter Praet is also not a fan of supporting bank margins. Italian Governing Council member Ignazio Visco prefers to focus on the bigger picture context framing the debate. Through this frame, he sees that the ECB will keep interest rates as low as they need to be; for as long as they need to be. Speaking for the ECB's Executive Board, Benoit Coeure tried to frame the deteriorating inflation bigger picture positively. For him, inflation is simply reverting back to the target median trend. This median reversion is driven by investors refusing to accept a lengthy period of upside overshooting. He has yet to ask the question why the sudden reversion and why now. It could be because the ECB is too successful at achieving its inflation target. Mr. Market may have been more interested in what Governing Council member Ardo Hansson had to say, than in the guarded commentary of his colleagues. Although not in the running for ECB president, he definitely ticks the "courage" box. He sees the economic slowdown dragging on into the medium-term. He is also quite prepared to ease monetary policy again, in the event of an economic shock. The duration of the current slowdown may well become the same thing as the shock that he refers to. Recently released minutes of the previous Governing Council meeting, also reflected the ECB's prioritizing of the perceived threats that the Eurozone economy faces. Keeping rates too low for too long was debated. This threat was, however, de-prioritized against the current threat to growth. On balance, therefore, the ECB has taken out the insurance policy of pushing back further attempts at normalization. The threat to the banking sector from prolonging ZIRP/NIRP has been addressed with the Band-Aid of TLTRO III. Looking at the new policy mix objectively, one immediately questions if the growth threat has been adequately addressed by simply kicking the normalization down the road. The real signal from these Governing Council minutes is the lack of consensus on what to do. Such a lack of consensus undermines any guidance and also weakens the effectiveness of the measures currently being taken. To be successful, a central bank must have consensus; even if that consensus is to do nothing. The main problem in mitigating ZIRP/NIRP is that the benefits will be skewed towards banks in nations that have net banking sector liquidity surpluses. Such countries already have stronger economies and hence the banking sector surpluses. As net sources of liquidity and capital, their banks will receive a further interest rate premium reward on their lending. Banks in liquidity deficit countries, who could really use the extra margin support, will not actually realize any such margin expansion because they already lack the surplus to lend at said premiums. This observation is important, because it directly influences the ECB's strategic objective of consolidating the banks. A risk mitigation process, that favors the strong banks by default, will clearly drive consolidation outcomes. Since the Eurozone is one single market and capital is free to roam, banking sector liquidity may then move from deficit to surplus countries in a similar manner to the Target II system. Such migrations would in effect be capital flight from deficit countries. Such capital flight would then make their economic situation even worse. This would then drive a new wave of consolidation in the business sector. The implications for consolidation in the public sector and thus ultimate economic integration are less clear. National protectionism lurks in the indebted public sector. Dealing with this has never been a favored topic for the un-elected EU policymakers. They will have to address it at some stage to keep the Eurozone Project alive. Support for the banks, by tinkering with interest rates, needs thinking through carefully before it is implemented. It may turn out to be counter-productive in the long-run, based on the liquidity surplus and deficit imbalances already in place within the Eurozone. The anticipated full-blown trade war, between the EU and America, took a step closer recently. Having been exonerated by Witchfinder General Mueller, not-Witch President Trump will be merciless with his critics and opponents. The EU strategy, of procrastinate and hope that he gets impeached, is now in shreds. US Ambassador Gordon Sondland recently reiterated that the EU is again falling short of America's expectations. This is nothing new, he has said it before. The important signal is in the timing, which infers that hostilities are imminent. France then shoved the EU's finger into President Trump's eyes, thereby guaranteeing that he will return the favor. The French ability to veto the collective EU negotiating position has allowed it to stall the commencement of trade negotiations even further. This tactic is a further shortfall in expectations of goodwill in the eyes of America. The discussions have effectively been sabotaged before they begin. No agreement can, therefore, be expected to be made, thereby bringing the risk of tariffs even closer. President Trump simply responded, to the latest EU spoiling tactics, by threatening a new set of tariffs on a new list of products. Most of these new tariffs will fall on exports from France and Germany. Boeing (NYSE:BA), which has recently fallen on hard times because of software glitches, was given direct support; through the threat to increase tariffs on Airbus (OTCPK:EADSF) because of its own state subsidies. Anyone trying to anticipate how this plays out is well advised to apply the American National Defense strategy rubric which was published last year. The foreseen enemies are emerging Great Powers. Although clearly aimed at China and Russia, the EU obviously fits the emerging Great Powers qualification. It certainly does so in President Trump's eyes. Secretary Pompeo recently said that China's trade activities are strongly linked to its national security goals. One must assume that the Eurozone is similarly viewed. Any trade war America engages in must be confluent and consistent with national defense strategy. In the age of nuclear weapons, economic warfare is actually safer and, thus, more important. Economic warfare is also much more important, when the enemies are actually military allies who cannot be engaged in mortal combat directly. A trade war between America and the EU should, therefore, be given the attention and significance that it deserves. The current US defense policy is to "deter and if war comes defeat". 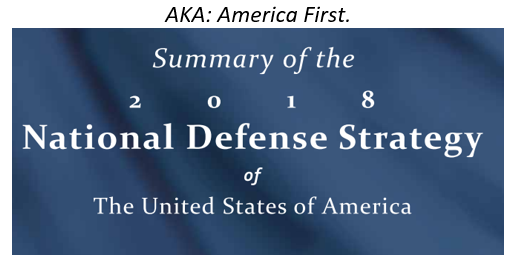 Thus far, we are in the deterrence phase, with threatened tariffs as the weapons of deterrence. Ambassador Sondland has, however, signaled that the contact point and then combat phase are very near. Tariff threats must, therefore, soon become tariff weapons, as the conflict escalates to the next levels. The issue of Climate Change will play out, as a major theme, in the trade war between America and the EU. 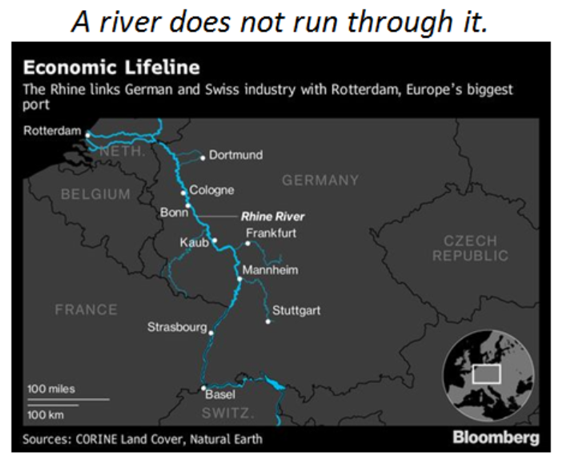 A recent report showed the impact of global warming on the German economy, via its trade artery of the River Rhine. The latest forecasts, from the hydrologists and satellite-imagers, are that this is going to get worse across the whole Eurozone. One current barrier to a trade agreement, between America and the EU, is the lack of commonality on rules and regulations in relation to emissions and Climate Change. The Europeans, as we see above, have no choice but to push for tighter standards. President Trump is in denial of Climate Change and in any case has an America First strategy that is antipathetic towards it in principle. There is therefore no fundamental common ground between the two sides, so that a trade deal which encompasses the European Climate Change agenda is totally out of the question. It can be said, in fact, that both sides are in fundamental opposition on this issue; thereby ruling out any deal. Indeed, it is in America's strategic interest to weaken Europe economically through higher emissions. Any trade deal will, therefore, be fundamentally flawed and prone to failure in the medium to long term. Germany is particularly compromised and existentially challenged by the Climate Change component of the trade issue. On the one hand, as the water level on the Rhine shows, it is aligned with Europe. On the other hand, as its weak Brexit hand shows, Germany is aligned with the Anglo-Saxon love affair with the internal combustion engine and Big Oil. So far, Germany has been incapable of reconciling the flapping of both hands into a coherent economic and political strategy. The nation is currently agonizing, over the purported existential threat from immigrants, whilst the large Carbon chain elephant in the room goes completely unnoticed by the average German. The ECB is evidently worried by the trade war threat. Perversely, however, it has responded to this threat through the amusing figure of Executive Board member Yves Mersch. He has delighted this author (and hopefully readers) with his circumlocution about conditions in the Eurozone. His latest offering of mixed metaphors and similes was his best so far. To allay American fears, he has apparently conducted his own exhaustive investigation. This investigation found no evidence of "Fortress Europe". It did, however, find the fingerprints and DNA of Eurozone "Industrial Champions". This is apparently not a crime scene of dirigisme, but small traces of European "chickens" playing "football" when the American (and Chinese) "foxes" are playing "rugby". The banking sector springs to mind, as a farmyard where this fun and games is currently taking place in Europe. The real crime, according to Mersch, has been perpetrated by Eurozone policymakers. These criminals have failed to enact any strategic economic reform. The resulting indebted and un-competitive Eurozone economy is thus undeserving of the monetary policy support it gets from the ECB. The baseline behind which ECB guidance hides was established at the previous Governing Council meeting. TLTRO III will be drip-fed into the banking sector, whilst the normalization is postponed and will be revisited later this year. With the terms and conditions firmly affixed to this bottle of policy, there is very little room for extemporization going forward. That is, until a real crisis unfolds in the press. ECB Vice President Luis de Guindos read verbatim, from these terms and conditions, in his recent remarks. In his view, growth and inflation will slow this year; avoiding recession and then will rebound next year. Whilst accepting that the Eurozone is not totally immune from global contagion, he feels that the impacts of American Lowflation are limited. The ECB can still normalize, whilst the Fed pauses, or so he would have us believe. The position of the French banking system, in the much anticipated Great Consolidation, was examined in the last report. French banks suffer from their high exposure to Italy and their domestic lending, which is way in excess of French GDP growth. French banks may thus find themselves the prey, as much as they would like to be the apex predators in the Great Consolidation. Bank of France Governor Francois Villeroy de Galhau was making noises about raising capital buffers. This noise has now become a fact, as French bank capital buffers have been raised. Showing his own Gallic fighting brand of dirigisme, Preudhomme de Galhau then began to nudge the tilt of the regulatory playing field in favor of protected French consolidator banks. His nudge is aimed at Eurozone policymakers, in the hope that they will cut capital adequacy requirements for foreign subsidiaries of pan-European banks. Said pan-European banks will thus have the capital costs of cross-border acquisitions of their rivals lowered. They should, therefore, in theory, be able to scale the walls erected by national regulators that protect their own domestic incumbents from foreign acquisition. The corollary effect is that, as French banks prepare to repel invaders and to subsume rivals, they will de-emphasize their own lending activities. A higher counter-cyclical capital buffer will also now make the lending game more expensive in capital cost terms. As French banks prepare for the Great Consolidation, their behavior will act as a headwind for the French economy. Any slowdown in the economy will then be discounted back into their share prices. Thus, as they attempt to become the predators, they also make themselves into the prey. Just as well then, that the French government is dirigiste and will erect strong protective barriers around the banks. Said barriers will then trigger reciprocal barriers in other Eurozone countries. Germany has responded with unashamed dirigisme, in the creation of a "national champion", through the merger of Deutsche (NYSE:DB) and Commerzbank (OTCPK:CRZBF). This dirigisme will be legislated further into life later this year; when the German parliament intends to create specific barriers and a national investment fund to prevent foreign companies acquiring German ones. Germany First, by default, means Eurozone distant second. French dirigisme may even extend to the Chairman of the Bank of France. Rumor has it that Preudhomme de Galhau is the main instigator, of the ECB's debate on supporting some banks by mitigating the negative interest rate pressure on their margins. Evidently, he wishes to support the French banks whilst alleging support for Eurozone banks in general. 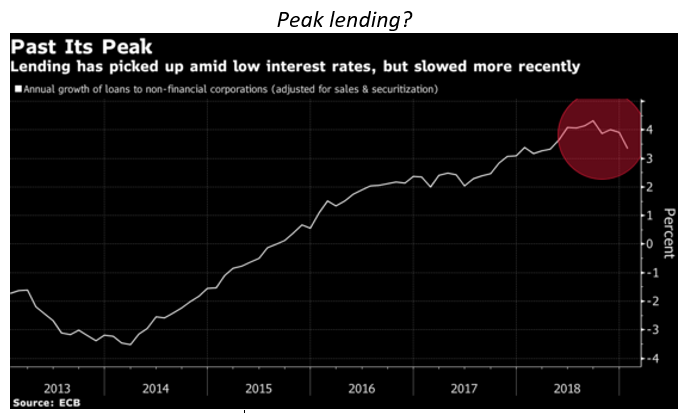 Mario Draghi is keen to sponsor the mitigation debate, because the trend of credit data suggests that the banks are rolling over and scaling back lending. Identifying and addressing the cause of this behavior is, therefore, key. The position taken by the Executive Board suggests that there is an inertial high bar to accepting mitigating tactics into the monetary policy framework. Board member Benoit Coeure recently opined that, as far as he can see, the credit creation process is operational and successful. The new round of TLTRO III will, therefore, be a sufficient insurance policy, to underwrite this successfully functioning credit creation process. The creeping dirigisme of some ECB officials is something that should be monitored carefully, as it threatens to split monetary policy making along national political lines. Plans for allowing an efficient market solution, involving private capital to consolidate the Eurozone banking sector will be set back by this emerging central banker dirigisme. More worrying is the prospect of monetary policy being taken hostage by these competing national agendas. Italy is providing another classic example of the creeping dirigisme being driven by populist political agendas. The Bank of Italy recently had an enforced personnel change in its banking supervision department. The government does not like how the central bank is handling the non-performing loan (NPL) issue and general banking crisis. Political pressure has resulted in forced resignations and selective hiring of replacements. Italian President Sergio Matarella is now so worried, that he has warned the Populists not to meddle any further with the Bank of Italy. It is a small step, from banking supervision personnel change, to monetary policy making personnel changes. In democracies, the will of the people must ultimately translate into its central bank, which devolves its legitimacy from the democratic voting process. The ECB is thus risking becoming a political platform, through which Eurozone nations lobby and promote their own national economic agendas. The next choice of ECB president will be strongly influenced by the need to avoid national political influence. Dirigisme in relation to national central banks' gold reserves at the ECB should also be monitored closely. A previous report noted that the integrity of the Eurozone and the single currency is contingent upon each member nation leaving its gold reserves at the disposal of the ECB. Evidently, dirigisme in this respect is playing upon Mario Draghi's mind. He recently reminded two members of the Italian parliament that "the purpose of this competence is to ensure consistency with the exchange rate and monetary policy of the Union." The Great Consolidation and hence deeper economic and banking union will thus be frustrated, by the combination of over-zealous macro-prudential regulators and protectionist politicians/central bankers. The Eurozone will find itself back at square one in relation to banking and economic union. It will, however, be several steps back from stage one; since it has initiated macro-prudential conditions, that have acted as an economic headwind, at a time when the Eurozone economy is already slowing. On the flip-side, this will nudge the ECB closer to its next phase on monetary policy easing. In a prescient move, which anticipates this final easing, the ECB has already begun chanting the mantra that QE has boosted bank lending. The ECB's top banking supervisor Andrea Enria has already voiced the central bank's displeasure at the dirigiste creation of national champions. Evidently, the ECB understands how dirigisme plays out for the Eurozone economy. It also understands that national champions will simply buy the sovereign debt of their own nation, as primary risk capital, thereby making the doom-loop that has linked the banking crisis with the sovereign debt crisis even worse. The ECB wanted cross-border consolidation to promote economic integration using private capital rather than taxpayer funds. It is now getting the antithesis of this. The German government finally gave up on pretending that the economy will avoid the economic headwinds blowing in all directions this year. Having cut its 2019 GDP forecast to 1.5% in November last year, it recently slashed it again to 0.8%. This gloomy cut was then echoed by the private forecasting institutes. According to Der Spiegel, this may get revised even lower to 0.5% soon. In seeking to defuse the crisis, by getting ahead of the data releases, Bundesbank president Jens Weidmann actually created greater concerns. He now finds it quite plausible to expect sub-one percent growth this year. His reticence, to give an actual estimate, simply raises expectations for something even worse than the current 0.5% guesstimate. The collective German reluctance to call a recession remains; and the forecasters look for a rebound to 1.7% in 2020. This view conflates with that of the Bundesbank. The latest monthly economic report from the German central bank noted the negative impact on the economy, from the weak industrial sector, being compensated by robust services and construction. German politics is becoming polarized. There are those who understand that the country faces a serious recession-like threat; and those who wish to press on with the kind of fiscal austerity and sado-monetarism that makes things even more painful. Angela Merkel is not so much in denial of the facts, as simply living in fear of the consequences, of telling the German people that the good times are over indefinitely. 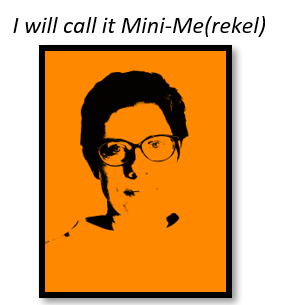 Her anointed replacement Annegret Kemp-Karrenbauer has yet to show that she is anything other than a Mini-Me (rkel). Germans have traditionally voted for the prosperous status-quo embodied by Merkel. Her refusal to tell them the truth speaks to the truth that this prosperity is over. It also speaks to the truth that a Mini-Me(rkel) just won't cut it as the new leader. The German leadership is especially in denial about informing the nation of the great threat from environmental legislation to Germany Inc. Low carbon emission has already taken a big chunk out of German GDP, from which the economy is yet to rebound from. This seems set to continue out to 2030 with the EU's latest tightening of emission rules. The only source of rebound for Germany is a full embrace of electric vehicles and low carbon emission energy generation for manufacturing. A fiscal embrace of this restructuring of the German economy would be the catalyst and tailwind that would create the expected rebound and much more. Thus far, the politicians will not contemplate the scale of fiscal deficit required for this Uber Keynesian New Deal. The more that they ignore it, the more it becomes the inevitable option. Perhaps, the Germans are waiting for things to break down irretrievably, between the EU trade negotiators and their Anglo-Saxon internal combustion driven rivals. They will not have to wait much longer. The resulting German procrastination has yielded a hybrid policy, that neither fully endorses economic reform nor throws big fiscal deficits at the problem. The failure to fall off the fence, one way or the other, may in fact lead to an even more painful backlash from the German people. German political vacuums, in times of economic weakness, can be very unpleasant places to be for some members of the polity and the rest of the world, in general. The German government's recently announced counter-cyclical fiscal stimulus is a mirror of its economic predictions. The government has approved a new deficit neutral fiscal spending package. Spending cuts will be used to finance the stimulus. Net-net, it's not really a stimulus, therefore, so Germany is betting on the global economic rebound as it continues to adhere to its "Black Zero" policy. Germany has therefore declined to do the economic heavy lifting required to keep the Eurozone economy from stalling. Additionally, German conservatives intend to promote "Black Zero" onto the Eurozone, in general. Such a promotion will involve a much tighter monitoring of compliance with Eurozone fiscal guidelines. This may even extend to fines and sanctions on fiscal transgressors. Not only will Germany avoid Eurozone economy heavy-lifting, therefore, it will also undermine any attempts at such lifting anywhere else in the Eurozone. Faced with the global and Eurozone risks and uncertainties, at a time of internal transition, the ECB is hunkering down for the long-haul. The ECB has decided to stick to its knitting and avoid the fatal temptation to, believe that it can "do whatever it takes" to, solve the economic and political threats looming on the radar screen. It has prudently decided to set out a rolling defense strategy, aimed at prolonging the monetary stimulus mechanism from its balance sheet to the Eurozone real economy. At its latest meeting, the ECB Governing Council set out its stall for this rolling defense. The first line of defense is guidance. Guidance now states that balance sheet normalization plans and interest rate increases are on hold. The next line of defense will be TLTRO III. A further line of defense, of tiered interest rates for the banks, may follow in due course (or not as the case may be). The TLTRO III defense line is itself rolling and scalable. It can be scaled up or down in magnitude, depending upon periodic economic forecasts. According to sources close to the ECB, the current scale is based on a forecasting consensus that the economic situation has stabilized. The next forecast date is in June. On announcing this rolling defense strategy, Mario Draghi outlined the deteriorating economic fundamentals upon which it is predicated. Such a deterioration will keep the ECB from raising interest rates again through the end of 2019. As he delineated the ECB's lines of defense, Draghi simultaneously tried to destroy the dirigiste walls protecting the banking sector from consolidation. His call, for further consolidation in the sector, only served to confirm the view that ZIRP/NIRP, QE and even tiered interest rates will be with us for an even longer time to come. In fact, they may all have to be increased in magnitude as well as in duration. Draghi's rolling defense lines have a risk that the defenders may start shooting across them at each other. Supporting the banks with TLTRO III may turn into a direct subsidy for Zombie banks, if it is scaled up indiscriminately as the Eurozone economy contracts further. Keeping Zombie banks alive works directly against the move towards consolidating the banking sector. The ECB needs to apply the economy of force. The innate subsidy to the liquidity surplus banks, from the mitigation process, may obviate the TLTRO III indiscriminate subsidy. Sources close to the ECB have disclosed that there may be a consolidating strategy, hidden within the mitigating strategy to support the banks. The word is that the ECB prefers to pay the banks that lend, rather than to keep weak banks on life support. It may also, however, provide the perverse incentive to Zombie banks. This would reward them for making even riskier loans, in order to avail themselves of the TLTRO III subsidy, whilst avoiding getting consolidated. After Draghi had blown a dissonant note on his whistle, defense of the Guidance Line swiftly followed. First into position, with bayonet fixed, was Mr. Le President in waiting Preudhomme de Galhau. His battle-cry is that the ECB will keep monetary policy, as loose as is needed for, as long as is needed. Governor Council member Klaas Knot showed that he is an unwilling conscript to the TLTRO III line. He conscientiously objects, to making the new round of emergency funding equally as or more generous than previously. Knot's actions are not dishonorable and worthy of discharge or court-martial, however. He may simply be preparing to go over the top, in the charge towards the Great Consolidation in the banking sector. Weakening the banks, with less emergency funding, brings this final charge even closer. Governing Council member Bostjan Vasle signaled that the rolling defense lines will be coordinated, with the twin objectives of achieving "the effectiveness of transmission of monetary policy over banks and macroeconomic conditions." He thereby intimated that the ECB intends to apply just enough TLTRO III, to enable banking consolidation, without disrupting credit creation, in general. Bundesbank President Jens Weidmann, consistent with his refusal to give economic forecasts, similarly won't get off the fence on the efficacy of a tiered interest rate mitigation process. Clearly, with the prospect of the merger of the two zombies Commerzbank and Deutsche into a protected predator, he doesn't want to be seen to be too close to the action. Chief Economist Peter Praet somewhat prematurely called mission accomplished on a successful completion of the guidance defense line deployment. Mr. Market can allegedly take credit for this success, for discounting the ECB's signal to delay this year's alleged interest rate hike, thereby creating the credit stimulus to support the economic rebound. Praet would argue that this proves that the monetary transmission mechanism from guidance is working efficiently. Ollie "Rehnfeld" is playing his cards and the economic data like a boss, on his quest to replace Mario Draghi. Having seized poll position recently, by calling for the total strategic monetary policy review, he simply consolidated his position. This consolidation was achieved by re-articulating his own message, rather than following that handed to him by Mario Draghi. In effect, "Rehnfeld" is saying that Draghi has failed, and now, a post-mortem is needed. He is saying it in that polite non-descript way, common to Scandinavians, that makes him so attractive as the next ECB President under current conditions. The mere fact that he is not French or German or a Southern European already puts him at the top of the pile. Now, he is just finessing it. "Rehnfeld" and Governing Council member Ignazio Visco recently joined Mario Draghi on a special mission, beyond rolling defense lines into the IMF's global colloquium in Washington. The objective of this mission appears to have been to inform the global audience, of the ECB's strategic intentions and capabilities, in relation to the global impact of its rolling defense strategy. The ECB agents informed their audience not to be alarmed or to expect a swift roll out of the rolling defense strategy. All feel that there is sufficient momentum within the Eurozone and global economy to create an economic rebound later this year. TLTRO III should thus be seen not as a new stimulus per se, but as an afterburner to maintain an expected economic rebound. Visco further informed on the line on defense of tiered interest rate mitigation. According to him, the impacts of ZIRP/NIRP on the banks are in fact negligible. This implies that the bar is high to tiered interest rate mitigation delivery. It also implies that any mitigation will be incremental. Most importantly, it implies that there is scope for even more ZIRP/NIRP and QE because there is nothing bad to mitigate. This rolling line of defense is all well and good. Unfortunately, the global economic situation needs elected policymakers to the rescue and relieve the siege of global central bankers and their banks. Thus far, elected policymakers are only interested in, their own political survival by, playing to narrow national populist sentiment. There is a distinct lack of global compromise and leadership. Elected policymakers are, in fact, besieging their own central banks, while they claw at the faces of their trading partners. Consequently, global central banks will remain under siege. The ECB had better start digging some more lines of defense and bring forward the monetary artillery.